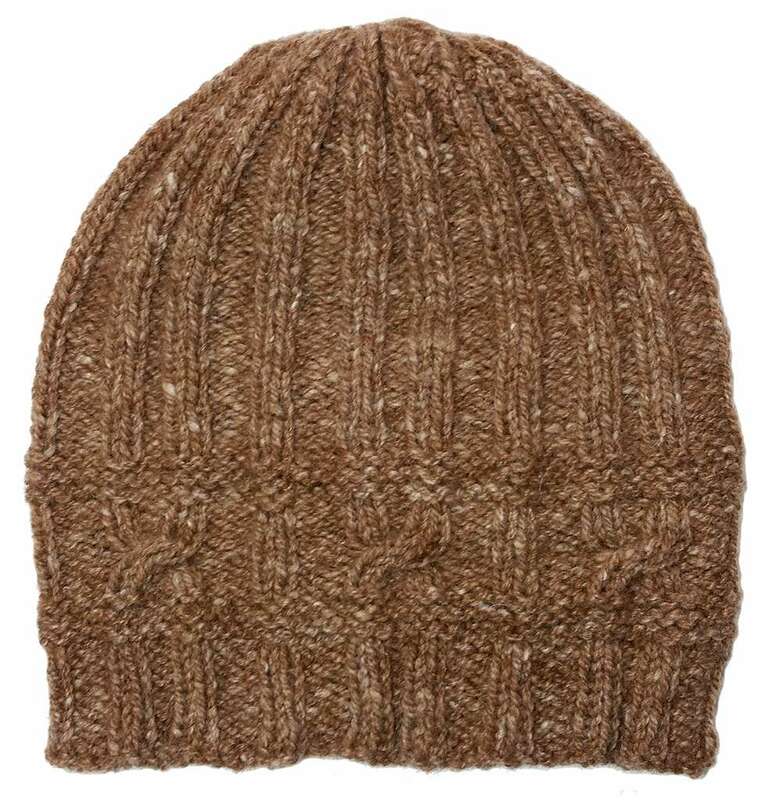 A hat to keep you cozy warm while on the trails or out and about town in the cool weather seasons. 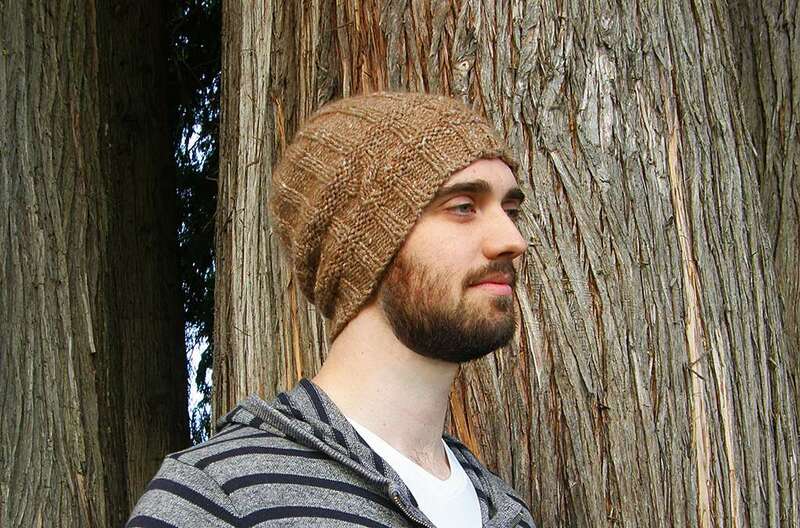 This unisex design is high on style and low on difficulty level, with its one and only row of cable design to really make this hat pop! 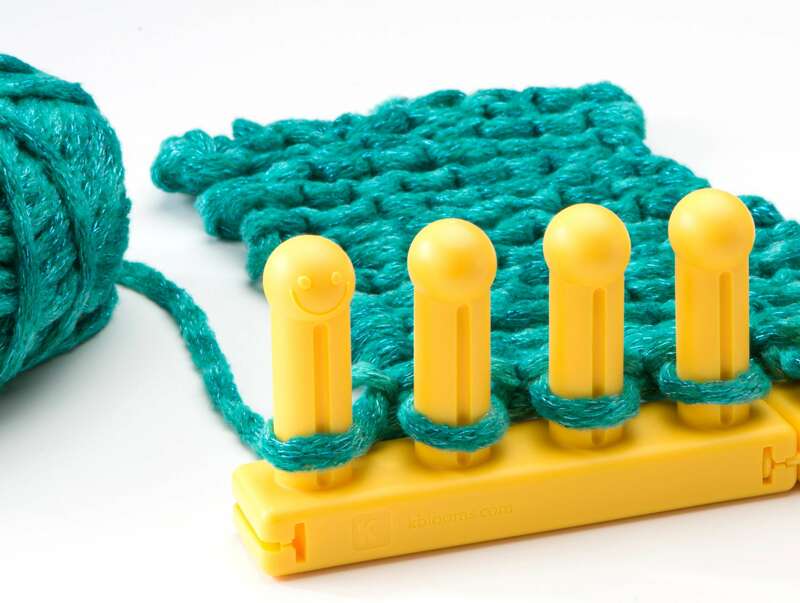 Knitting Loom: Adjustable Hat Loom set to the large size, 84 pegs, with pegs in each hole. 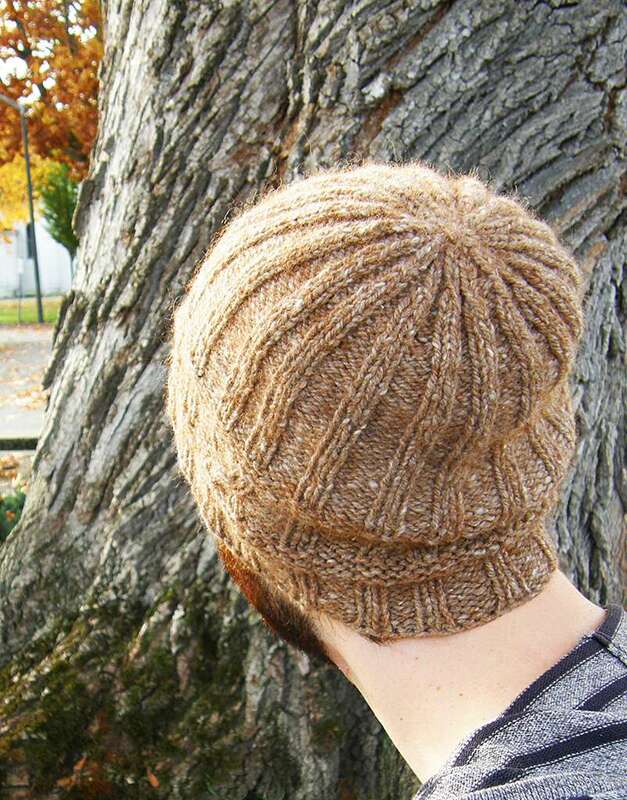 Yarn: Approximately 140 yards of worsted weight yarn. Sample used handspun yarn 50% merino wool 50% alpaca. Notions: knitting tool, cable needle, one removable stitch marker, 6mm crochet hook (for cast on and help with possible missed stitches, etc), scissors, knitting pins, yarn needle, row counter. Gauge: 4 sts x 7.5 rows= 1 inch (in pattern, using U-Stitch). Finished Measurements: Circumference: 21″, Height: 10″. 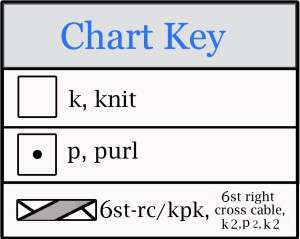 Skills Needed: Knit/U-stitch, Purl, 6st-rc/kpk Cable (described in Pattern Notes), Chain Cast On (or CO of your choice). 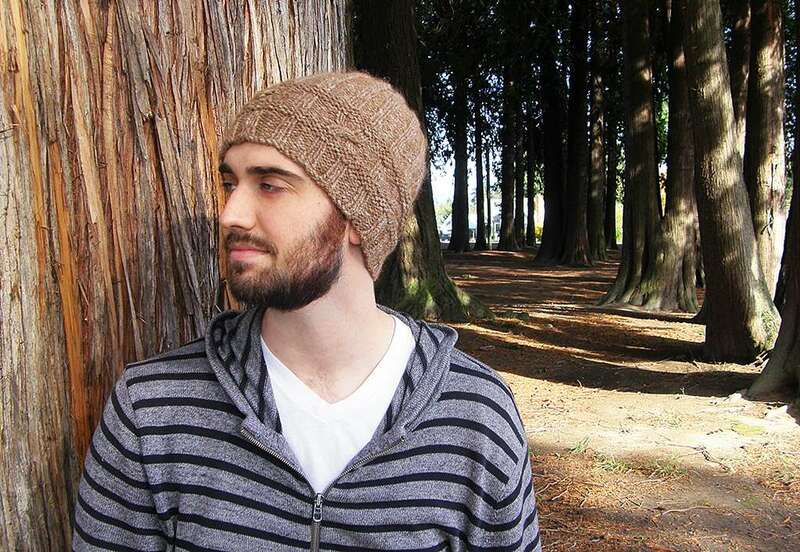 Flat Drawstring Bind Off tutorial (instructions for this specific hat are included in the Finishing section below…video is listed for a helpful visual). *Note: It helps to knit the row before the cable row looser than normal to aid the cable stitches in stretching to their new places. It may help to ewrap the first 2 and the last 2 stitches that will be worked into the cable in the following row, just make sure to untwist the ewraps before knitting them into the cables. -Lift the loops from the first 4 pegs of the cable (1-4) and place them on the cable needle. -Bring your working yarn behind pegs 1-4 and knit the stitch on peg 5. -Move this stitch (peg 5) over to peg 1 of the cable pegs. Pull out any slack in the yarn that is allowable at this point. -Bring your working yarn behind pegs 2-5 and knit the stitch on peg 6. -Move this stitch (peg 6) over to peg 2 of the cable pegs. Pull out any slack in the yarn that is allowable at this point. -Lift the first stitch from the cable needle that was previously on peg 4 and move it back to peg 4. -Lift the second stitch from the cable needle that was previously on peg 3 and move it back to peg 3. Purl these 2 stitches (pegs 3 & 4). -Lift the stitch from the cable needle that was previously on peg 1 and move it to peg 5. Knit this stitch. -Lift the last stitch from the cable needle that was previously on peg 2 and move it to peg 6. Knit this stitch. 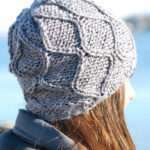 -Work out any slack that may be left throughout the 6 cable stitches. Set loom to use 84 pegs, with pegs set in every hole. CO onto all pegs in the round. Rnds 1-10: *k2, p3, k2, p2, k2, p3, rep from * to end of rnd. Rnd 21: *k2, p3, 6st-rc/kpk, p3, rep from * to end of rnd. Rnds 22-25: Rep Rnd 1. Rnds 26-31: rep Rnds 11-16. Rnds 32-62: Rep Rdn 1. Move the center purl loops over one peg and purl 2 loops together as 1 while working the row below. The spaces can be just left alone and the yarn carried behind the empty pegs, or each 3 peg connector can be removed from the loom and the sts moved to fill in all the empty pegs. If the loom sections are removed, the loom will now be unconnected on the sides, but it is still held together by the knitting, so can continue to be worked. Rnds 64-68: *k2, p2, rep from * to end of rnd. At every pair of knit stitches, move one knit loop over to the other knit peg and knit 2 loops together as 1 while working the row below. Each 11 peg connector can be removed from the loom and replaced with a 3 peg connector on each side. Shift the sts to fill in all the empty pegs, but there will still be 2 pegs left empty. Situate these 2 empty pegs so that one is placed in between 2 different sets of purl pegs. Rnds 70-74: *k1, p2, rep from * to end of rnd. -Wrap WY around the loom twice and cut at this point. -Add a yarn needle and thread through every purl st in order, trailing the WY behind the knit pegs. Release all purl sts from their pegs. Give the WY a gentle pull to add tension on all the purl sts. -Add a removable stitch marker onto your WY at this point. -Thread through every knit st in order, releasing them from their pegs. -Firmly pull the yarn tail section that is before the stitch marker, so that all the purl sts are now completely gathered closed. -While keeping this section tight, firmly gather the remaining knit sts closed and knot in place. (Remove the stitch marker just before completely closing the knit sts section.) Sew closed any opening still remaining. 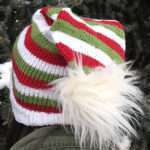 -Pull tail to the inside of the hat and knot the purl gathers securely in place. Weave in all ends and block to size preferred.